Avé is a teenage girl who arrives at a roadside outside Sofia and starts to thumb a ride. Already there is art student Kamen and he isn’t too keen to have competition. Inevitably though, the two get a ride together and the adventure begins. This is a road movie/romance/coming-of-age drama with a leavening of humour, mostly supplied via the performances of Andjela Nedyalkova as Avé and Ovanes Torosian as the long-suffering Kamen. As the journey continues, Kamen discovers that Avé likes to reinvent herself for every new situation and he tries to separate from her when her fantasies threaten to involve him. But we know he can’t – this is a road movie and they’ll get back together. A prologue has already hinted at Kamen’s need to travel to the town of Ruse on the Danube across from Romania for the funeral of a friend, but it’s some time before we learn the reason for Avé’s journey – and should we believe her anyway? I’m not sure if I’ve seen a Bulgarian film before but I recognised the region. The ‘Scope digital print looked very good and I enjoyed the film very much. It’s a first feature by co-writer and director Konstantin Bojanov who has previously been involved in documentary production. It was a pleasure to take in long shots of landscapes. Although Bulgaria isn’t at its best viewed from major roads, there is still a sense of adventure and who can resist a story that holds out the promise of a trip to Varna (from whence came Nosferatu/Dracula)? Avé tells us at one point that she has lived in Delhi and that you can find Indian girls in Bulgaria. Again this could be a fantasy but it is a road movie staple, that sense of wanting to be somewhere else. In reality, the distances the couple travel are not very long (300 kms from Sofia to Ruse) but they seem greater in narrative terms. This interesting interview with the director reveals that the film was completed for around 600,000 Euros and that it s story was partly based on his own experiences. Bojanov has lived in New York for the last 15 years but he tells us that his self-education in films (he was at art school in Sofia) was of 1960s and 1970s European and American New Wave films. He cites Y tu mamá también as the kind of modern road movie he likes – and that makes sense. I’m not sure if Konstantin Bojanov is a diasporic director as such – are there Bulgarian communities in the US? – but his film certainly has both a ‘local’ and a ‘global’ feel. Nice music too. Avé is a specialised film, not a commercial mainstream film so don’t expect a Hollywood ending. I’m glad about that because it meant I could leave the screening thinking about travelling by train through Bulgaria and wondering what happened to Kamen and Avé. I expect to see more of Andjela Nedyalkova who has genuine star quality. 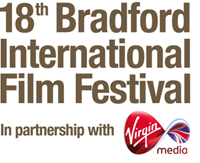 This is one of the six films in competition in Bradford and it stands a good chance of winning. It has already been picked up for distribution by Network Releasing so watch their website for details of screenings. This entry was posted in East European Cinema, Festivals and Conferences and tagged BIFF 2012, Bulgarian cinema, road movie, Romance, youth picture. Bookmark the permalink.